Road trips are an excellent way to show your kids that travelling isn’t just about the destination, it’s about the journey, too. While road trips can be lots of fun, they can also lead to epic backseat meltdowns when kids have had enough. Before you set off, create a list of items you know for sure you’ll see on the road — and some things you’ll see if you’re lucky. Have everyone work together to check off items on the list. This keeps kids’ eyes off electronic screens and out the window instead. Items to add to your list include things like 10 red cars, 3 dogs with their heads out the window, 2 fruit stands, 5 gas stations, etc. Be creative! You can even get everyone involved in making the list. A GPS is great for telling you (literally) how to get somewhere the fastest. But there’s something to be said for getting a big picture idea of where you’re headed and what places you’ll pass through. Before you start your journey, sit down with your kids and show them the route you’ll be taking on a paper map. Identify places, like cities or points of interests, which the kids can mark as milestones as you pass through. “Marking a milestone” can be as simple as everyone in the car cheering. Or, it can be something more tangible, like stamping a page in a homemade “Passport” you’ve created beforehand. Instead of giving your kids all their toys right from the beginning, put together travel goody bags. 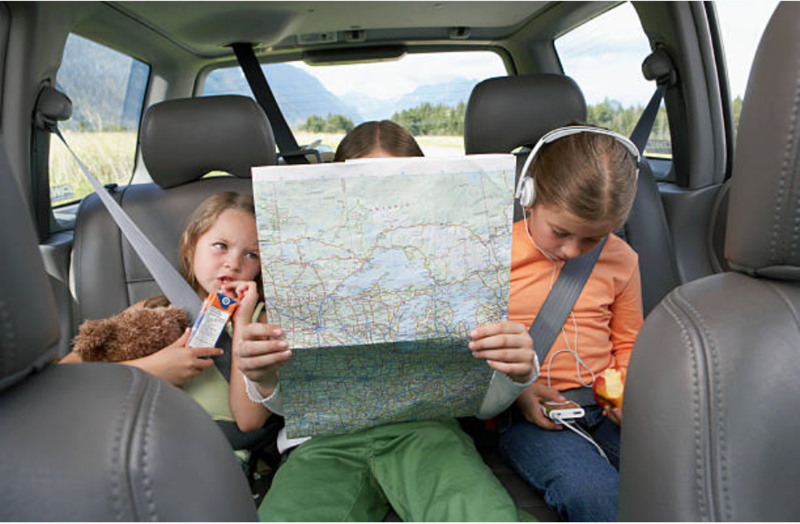 At each leg or pit stop of your trip, let your kids pull out a different activity or toy. Ideas for goody bag items include books, art materials, and puzzles. You could also pair this idea with the previous one and make the goody bag the prize for marking each milestone. This will get everyone’s creative juices flowing. Choose a theme, a main character, and a setting. Someone starts the story off with one sentence (hint: “Once upon a time…” is a good way to start). The next person adds on with another sentence. You keep going around in circles until the story ends or it’s too ridiculous to continue. It’s hilarious to see where the story ends up! Play dough, markers, and finger paint can mean a big mess in the back seat. Instead, use pipe cleaners to ensure a mess-free and creative craft. Give your kids pipe cleaners in a variety of colours and encourage them to make sculptures, words, pictures and anything else you can think of. You can even challenge them by pointing out things you drive by and having them try to make it out of pipe cleaners. Podcasts are becoming more and more popular, and there are a lot out there that are great for both kids and their parents. They’re not all stories, either. Many of them feature interviews and talk shows, or explore different science and nature topics. Not feeling the podcast? You can always listen to an audiobook instead. Even though you’re a family, there’s still lots to learn about each other. A fun and silly way to find out each other’s preferences is to ask each other “Would you rather?” questions. For example, would you rather live in an amusement park or live in a zoo? Would you rather hold a snake or kiss a jellyfish? Questions can range from somewhat serious to incredibly silly. How everyone answers can lead to interesting discussions as a family, too. We all see the world differently. For each leg of your trip, give one passenger (except the driver, of course) the camera and tell them to take pictures of whatever they’d like. Pictures could be inside the car, outside the car, of themselves, or of other members of the family. At each pit stop, or at the end of each day, look at all the pictures as a family. You’ll end up with some great candid shots of your trip! Snacks are an essential part of road trips. But digging around for various snacks from the front seat can be a pain. Pill boxes are a great way to keep snacks organized and to control portions. Just put bite-sized treats like goldfish crackers and raisins into each compartment and your kids can eat them on the go! You can also get bento box-style lunch containers, which have separate compartments for different kinds of food. It’s hard to draw or write on paper in a moving car, so why not let the windows be your child’s canvas? Get washable window markers and let your kids decorate your car windows. Just be sure that they’re only drawing on the windows!